The S.T.O.P. Program is an innovative partnership between snowmobile volunteers and the police. It started as a pilot project in Sudbury during the 1992/1993 season in response to a series of alcohol related fatalities. The program was given Provincial Program status by the Solicitor General in February 1995, was approved for expansion, and has matured into a proactive, community driven program. S.T.O.P. Officers are volunteers from the snowmobile community who are sworn in / designated as Special Constables / Provincial Offenses Officers by the Province of Ontario. They enforce the Motorized Snow Vehicle Act and, where empowered by municipalities, the local snowmobile bylaws. 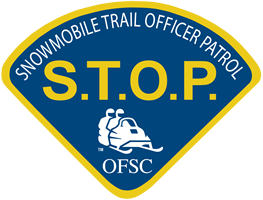 Operating under a protocol agreement at the provincial level between the OFSC and the O.P.P., the volunteers goal is to improve the sport of snowmobiling. S.T.O.P. officers contribute to safety on the trails by enforcing snowmobile laws, assisting police wiht sobriety spot checks, alcohol interdiction efforts and addressing public nuisance complaints. Off the trails S.T.O.P. officers provide education in schools, displays in malls, snowmobile shows, parades and other municipal events, and help with driver education.